A satellite that gets rid of space junk could help prevent devastating collisions in Earth orbit. Satellites play big roles in modern life. Some look downward to monitor environmental conditions on Earth. Others look outward in search of major solar flares that can disrupt the transmission of electrical power to homes and businesses. Some spy on our enemies. Others relay communications around the globe. But all of these million-dollar marvels of technology can be knocked out by a collision with space junk — debris from satellites and other Earthly technology orbiting high above the planet. Now, a teen from Jordan has designed a satellite to chase down space junk, collect it and then dispose of it. NASA is the U.S. space agency. It and other organizations are tracking about 500,000 pieces of space junk that are currently orbiting Earth. Many come from satellites or rockets that have blown up and shattered. The objects being tracked are the size of a marble or larger. About 20,000 are at least the size of a softball (some are as large as a refrigerator). Most are too small to detect from Earth’s surface. 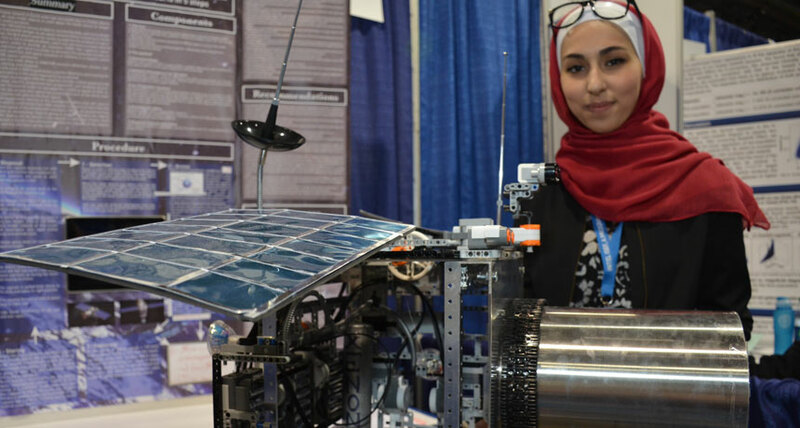 In all, some 100 million pieces of debris likely orbit Earth today, says 15-year-old Dana Arabiyat. She attends Alridwan Schools in Amman, Jordan. Even bits of space junk as small as flecks of paint pose a threat, says Dana. That’s because this debris orbits our planet at speeds up to some 28,200 kilometers per hour (17,500 miles per hour). That’s about 7.8 kilometers per second! Such blistering speed explains why tiny paint flecks have chipped the windshields of space shuttles so badly that they needed to be replaced. Researchers have come up with many ideas for getting rid of space junk. Some have suggested vaporizing small bits with lasers. Others have proposed launching satellites to collect the debris. Dana’s design falls into this category. Here’s how hers would work: A radar system aboard the satellite would scan for and find a piece of space junk. Then, thrusters would change the satellite’s orbit so that it could chase down the errant object. As the satellite closed in on its prey, cameras would keep it on target. At the last minute, a door that leads to a bulletproof container would open. This container needs to be strong so that it doesn't break apart when the satellite swallows the space junk, Dana explains. In some cases, she notes, the difference in speed between the satellite and the debris could still be pretty big. Finally, when the trash container was full, it would be lowered toward Earth on a kilometers-long cable and it contents released into the upper atmosphere. There, the space junk would harmlessly burn up just like a meteor does. Meanwhile, her satellite would reel the container back up so that it could collect more trash. Dana presented details of her research here at the Intel International Science and Engineering Fair. This event was created by the Society for Science and the Public (which also publishes Science News for Students). The annual competition is sponsored by Intel. This year, it brought 1,702 finalists to Pittsburgh in mid-May from more than 70 countries. Dana’s satellite will be able to collect bits of debris up to 50 centimeters (about 20 inches) across. If engineers wanted to catch larger bits of space junk, they could build a version of her design with a larger door. But that might also require a far stronger trash bin. That’s because the bigger the junk, the more damage it could do to the container as it’s caught.